ZAMBOANGA CITY (Mindanao Examiner / Oct. 10, 2011) – Philippine authorities detonated a pipe bomb left behind by a motorcycle man on late Monday in Zamboanga City, officials said. Officials said the explosive was left at a van yard in the village of San Roque, where a bomb explosion ripped through a cockpit arena on Sunday and wounding 6 people; and another bomb attack on a pension house also left 5 people injured. “The bomb was recovered and detonated. Among the components recovered were a PVC (Polyvinyl chloride) pipe, time fuse and metal bearings,” Army Lieutenant Colonel Randolph Cabangbang, a spokesman for the Western Mindanao Command, told the Mindanao Examiner. He said villagers reported seeing a man on a motorcycle, his face covered with a black crash helmet, left behind a small plastic bag and hurriedly left. 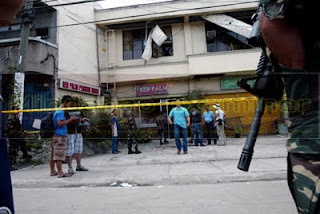 “Apparently, the residents reported the information to the police and the EOD (Explosive Ordnance Disposal team) immediately responded to the place and detonated the pipe bomb,” Cabangbang said. It was not immediately known whether the man was involved in the bombings that coincided with a Christian festival honoring the Virgin Mary. Police said the bombings could have been carried out by the Abu Sayyaf which authorities said have links with the al-Qaeda and Jemaah Islamiya. Military and police forces have tightened security in the city following the twin attacks.